Lijiang Guides is one of the first professional guiding operations in south-west China. The founder of Lijiang Guides, New Zealander Keith Lyons, first traveled to south-west China in the mid-1990s, and has been part of a number of expeditions exploring remote parts of Yunnan, Sichuan, Guangxi and Guizhou provinces. He set up the Lijiang Earthquake Relief Project following the large quake in 1996, and has been living in north-west Yunnan for the last decade. The award-winning writer and photographer is also an advisor to the Eastern Tibetan Training Institute, and director of the Myanmar travel operation, Slow Burma Travel. 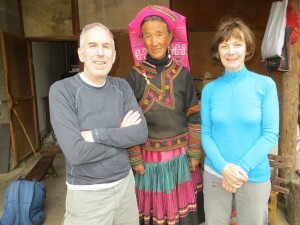 What makes Lijiang Guides different? Lijiang Guides has staff with almost two decades of experience traveling in south-west China, including 9 years living in Yunnan. Lijiang Guides are experts on south-west China, its varied geography, its fascinating ethnic minorities, and off-the-beaten-track destinations. Among the guides working with Lijiang Guides are excellent, English-speaking representatives from Bai, Nakhi, Tibetan, Lisu ethnic minorities as well as Mandarin-speaking foreigners with specialties in such areas such as traditional Chinese medicine, tea, and Tibetan Buddhism. To find out more about our guides, please click here. We not only provide professional guiding services, but also are leaders to the development of sustainable tourism in Yunnan. Our long-standing community involvement as a key player in tourism has been reflected in a number of articles in magazines and newspapers published around the world – and we are also featured in guidebooks and travel books. At Lijiang Guides, we are committed to sustainable tourism that benefits local communities and the environment. For each multi-day trip, we’ll plant a tree (and if you like, we can plant it together). And for trips for a week or more, we’ll donate a solar cooker to a remote village. Contact us about other opportunities to give something back to local communities.